Jack Z: Don’t get your coffee without him. Early this morning, Jim Bowden tweeted that perhaps the Mariners’ motivation for inserting themselves into the rumored multi-team Justin Upton trade scenarios was to ensure Texas was out of the running for Josh Hamilton. 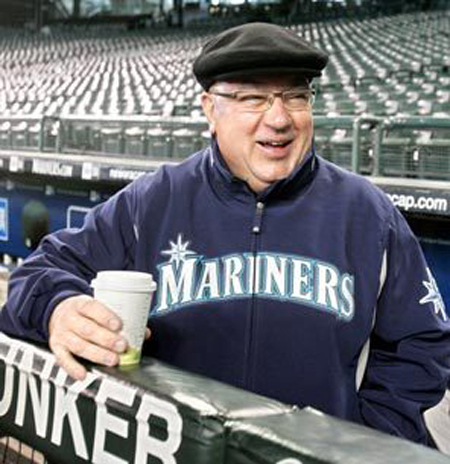 It’s probable that, even if you think Mariners’ GM Jack Zduriencik is a genius, the M’s would have to be dropping names of at least one of their top prospects: Nick Franklin, Danny Hultzen, Taijuan Walker, James Paxson. If that’s true, that means Jack Z is serious about going after Hamilton. • A portion Mariners’ clubhouse has been converted into a substance-free nightclub, which should appeal to the two sides of Josh Hamilton. It includes an oxygen bar, “wholesome” waitresses, fluffy slippers, and copious chewing tobacco spittoons. • Jack Z has contacted the Brewers, telling them that he will take back all the draft picks he ever made for them if they offer Hamilton a significant contract. This would result in the loss of millions and millions of dollars of revenue for the Brewers, including the retroactive disappearance of their playoff appearances in 2009 and 2011, which were fueled by homegrown players such as Prince Fielder, Rickie Weeks, and Ryan Braun. • The Mariners will employ a tattoo artist who will travel with the team. • Also relating to the Brewers, Jerry Narron is missing. What else will that rascal Jack Z do to acquire the dangerous (in every sense of the word) Hamilton? The Investigative Reporting Investigation Team will keep you up to date! We hoped you liked reading Jack Zduriencik: Meddler by Robert J. Baumann! Don’t forget that Seattle and Hamilton are a perfect match: The strongest drink that Hamilton can have is coffee, and Seattle is well known for their numerous coffee shops and for having some of the best coffee in the country. The other ‘best fit’ would be the Salt Lake City Bees.